...and the results were beautiful. I am not sure which I like better but no reason to decide. I can switch! 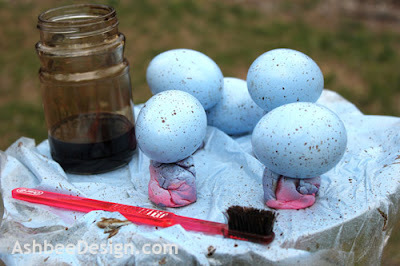 Here are the steps for making the blue speckled eggs. 1. First of all use hand blown eggs. 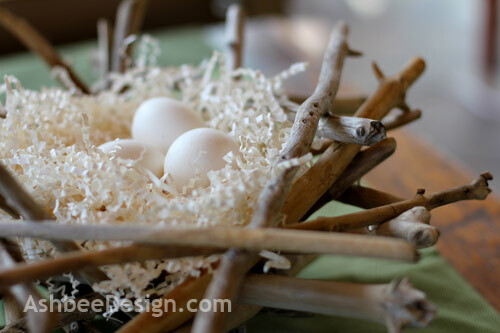 The web is filled with the how-to steps for that activity but I have linked to this one in the past. 2. Fill the holes left from blowing. I developed a technique using Spackle which I blogged about here. 3. 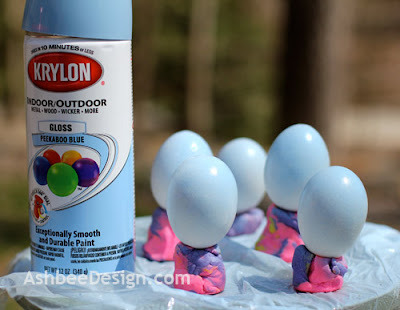 Set up your eggs for spray painting. I worked outside because the weather was beautiful. I use a Rubbermaid lazy-susan that served for years in my bathroom closet. I like to have a turntable when spray painting small objects. 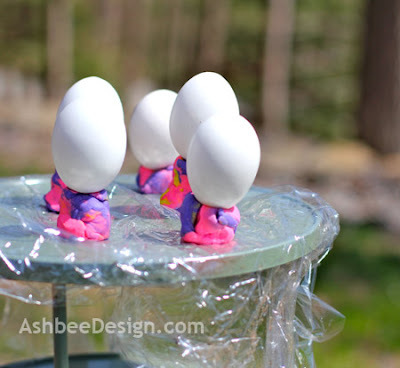 I covered it with saran wrap and put globs of Play-Doh on top to hold the eggs in place as I sprayed them. 4. 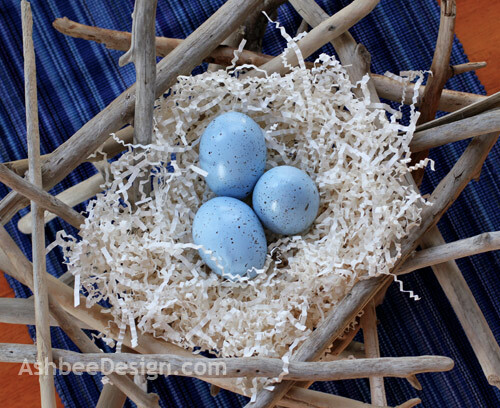 I used a Peekaboo Blue Krylon spray paint left-over from a previous project. 5. As always with spray painting, make many light coats allowing the paint to dry in-between. 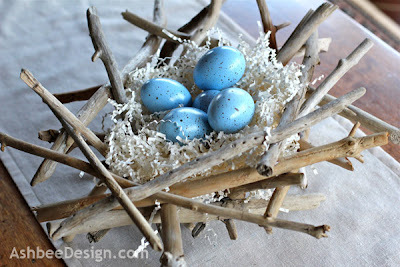 I did three coats on the top and then flipped the eggs and did three more coats on the bottom. 6. I put a small amount of dark brown wood stain in a jar and dunked an old tooth brush into the stain. 7. Holding the tooth brush about 12" away from the eggs I pulled my finger back toward me over the bristles of the tooth brush. A fine spray of speckles splattered the eggs. I continued splattering until the eggs had enough spots. 8. The stain spots took a lot longer to dry than the spray paint. 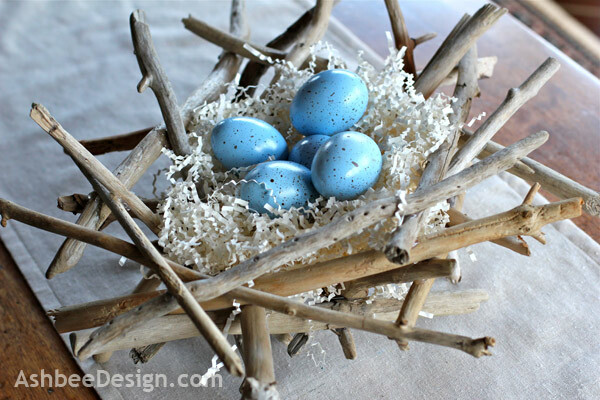 I had to leave the eggs over night before I could handle them with out smudging the stain dots. Which do you like better? 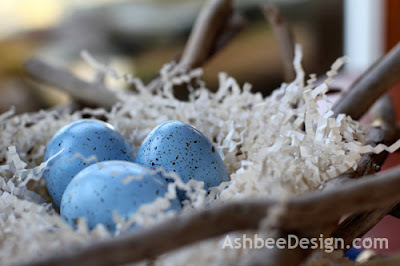 The blue speckled or white eggs? Click here to go to the tutorial on making the bird's nest out of driftwood. Very easy! Marji, they both look beautiful, but I think I like the blue ones best. They look really natural!